It's been a while since the first plugin release. Aside of small improvements and bug fixes, here are the most prominent changes you may want to know about. 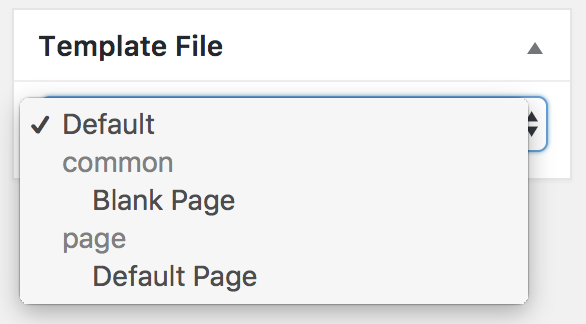 If you've had installed version 1 previously and upgrading to version 2, please carefully read the Template Files section as this major version update introduces different approach to the page templates integration with themes. If you've been using existing template files before, you'll need to create new files that are compatible with the version 2. Otherwise, you may have unexpected results or break the website. Previously plugin offered ability to utilize one of the existing theme templates to render custom page template with. Since different themes implement different techniques for rendering content, sometimes there were conflicts and led to unexpected results. In this newer version, the use of existing theme templates has been dropped and introduced another explicit way for registering compatible template files. Plugin also offers easier and flexible ways for creating and integrating custom theme files. You can read more about it here. 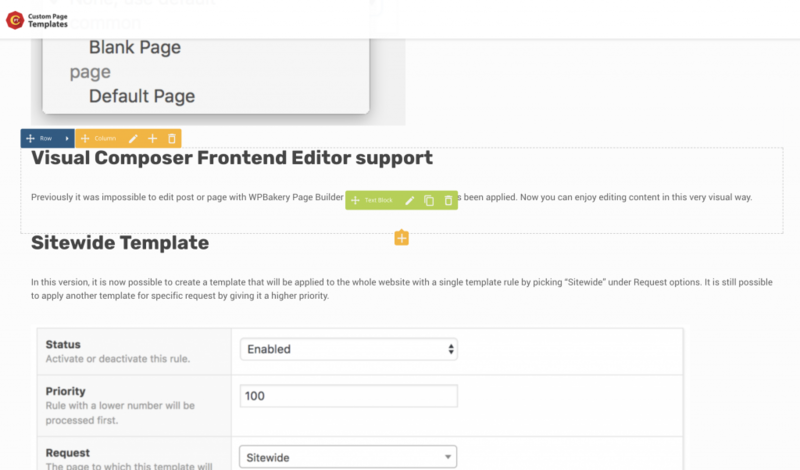 Previously it was impossible to edit post or page with WPBakery Page Builder if custom page template has been applied. Now you can enjoy editing content in this very visual way. 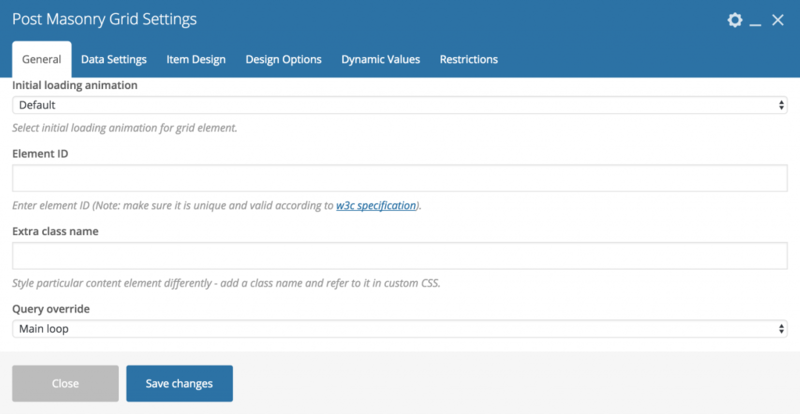 In this version, it is now possible to create a template that will be applied to the whole website with a single template rule by picking "Sitewide" under Request options. It is still possible to apply another template for specific request by giving it a higher priority. If you would try creating a custom template for author pages and use one of VC Post Grids to list posts, you would notice that it's nearly impossible to make grids work that way. This issue has been solved by adding Query Override options under General tab of VC Grids shortcodes. Now you can just pick "Main loop" and grid will list posts according to the currently requested page: author, search or whatever. Previously it was possible to display post comments via Dynamic Values only by rendering theme file, e.g. replacement had to be Theme Template -> comments.php. This word well in most cases, but if you wanted to integrate commenting system like Disqus, then comment.php wouldn't deliver desired result. Now there is a new replacement option "Comments Template" under Post group, which utilizes WP's standard function comments_template() to render comments, that such plugins like Disqus hook to. Previously it was impossible to utilize complex ACF fields for replacements in shortcode attributes, because such replacements could break shortcode markup due to different formatting according to ACF field settings. Now CPT plugin adds additional ACF field setting "DSV Formatting", which allows you to better control how the value from ACF field should be formatted. A good example for this would be feeding images from ACF Gallery field to VC Media Grid or Masonry Media Grid. Sometimes, themes install plugins under custom folders. For example, Salient theme places Visual Composer under js_composer_salient, instead of js_composer. Such active plugin detection wasn't possible with standard WP tools before. and as a result a corresponding set of features was not available. Now, CPT plugin has own improved method for detecting compatible active plugins and such cases as above is not an issue anymore.